Ever had that moment during the day when you have been so busy and stressed that you somehow forgot to eat lunch or you have powered through the mid-afternoon munchies and then hangry sets in? I know some of you all already know too well what I am talking about when I say hangry, but for those of you that don't know what hangry it is basically when you are so hungry that you are pretty much angry. You don't feel quite like yourself. Your patience wears thinner a little quicker. The smallest thing can agitate you and make you snap. Yep, that is hangry, my friends. And hangry isn't pretty. I have been guilty of being hangry more times than I would like to admit. Rather it be because I am trying to power through some blog post guidelines while dealing with a toddler meltdown (and you know that they always perfectly time to throw down the major ones right when you are the busiest ;) ). Or out running errands, picking my son up from practice, and just getting the general business of keeping our home & family running smoothly. And boom! It hits me- hangriness. And that is when I remember that I haven't ate a thing for over 5 hours. Preheat your oven to 300 degrees. Toss the oats with the melted coconut oil to coat well. Spread the oats evenly onto a silicone mat or parchment paper lined baking sheet. Bake for 10-12 minutes, stirring halfway through. Oats should be fragrant and toasty when done. Set aside and allow to cool. In a small saucepan, bring the honey to a boil over medium-high heat. Let the honey boil for just 1 minute. While the honey is boiling, mix the oats and rice cereal together in a large mixing bowl. Remove the honey from the heat and immediately stir in the peanut butter. Quickly pour the peanut butter/honey mixture over the oats and rice cereal. 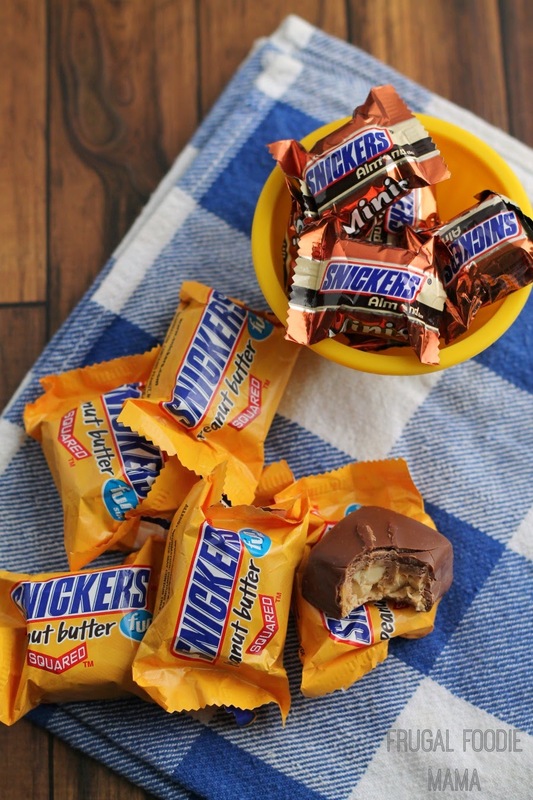 Mix for 30 seconds, then add in the chopped SNICKERS Peanut Butter Squares and the chia seeds. Mix another minute or two to get the chocolate and chia seeds well incorporated. Immediately spread into an 8x8 or 9x9 baking pan lined with parchment paper (leave an overhang of paper on each side). Press down hard to get the mixture evenly into the pan. Place the pan in the fridge and allow it to set up and harden for about 1 hour. Remove the pan from the fridge and transfer it by the parchment paper to a large cutting board. Remove the parchment paper and then using your hands or a chef's knife, break into large chunks. Transfer the crumble to an airtight storage container. Crumble will stay fresh in the container at room temperature for up to 2 weeks. 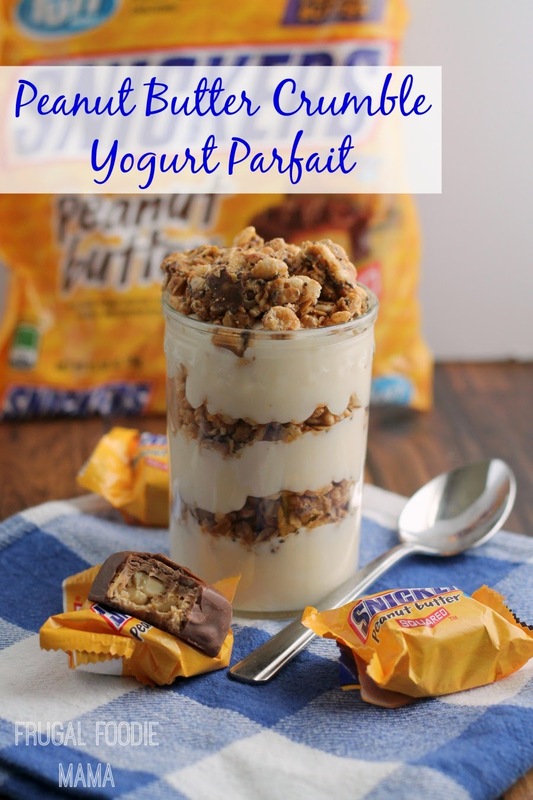 Grab a handful for a snack or make into a yogurt parfait. 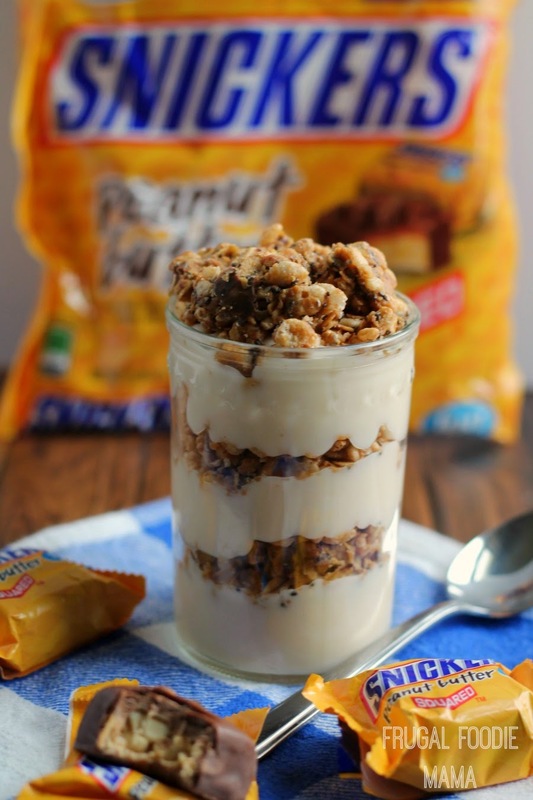 In a pint sized mason jar or small glass, layer the peanut butter crumble with your favorite vanilla yogurt. Feel free to throw in some sliced strawberries, raspberries, or blackberries to create a peanut butter crumble & jelly parfait. Not only is this Peanut Butter Crumble great for chasing away mama hangriness, but it makes a the perfect, quick snack to fuel my son through his track practices each afternoon. My husband will also take a couple of handfuls in a baggie with him to work. Working in a busy car dealership, he doesn't always get a chance to heat up his food or run out and get something. 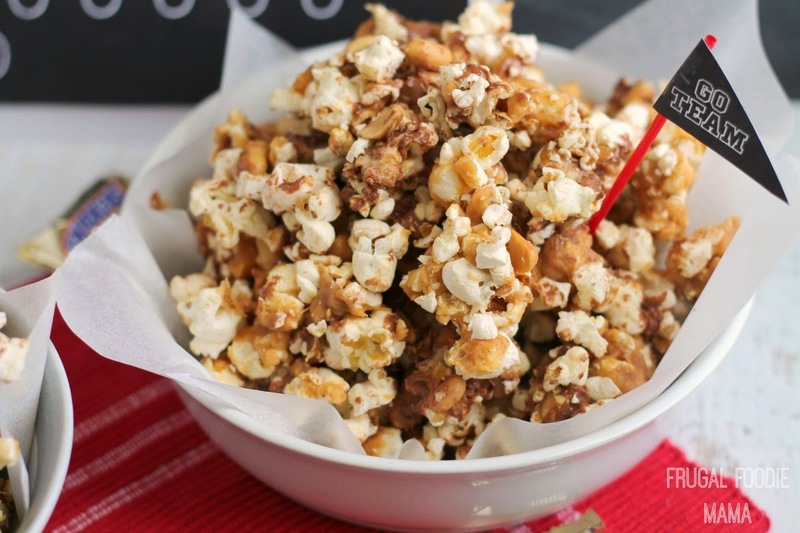 This crunchy crumble holds him over until dinner on especially busy days at work. Layered in a yogurt parfait- you can even add in fruit like banana slices, sliced strawberries, raspberries, or chopped apple. I wouldn't suggest making one of these parfaits ahead of time since you may end up with a soggy crumble. Taking it on the go with a cup of yogurt- throw a little crumble in a plastic baggie and grab a cup of your favorite yogurt. 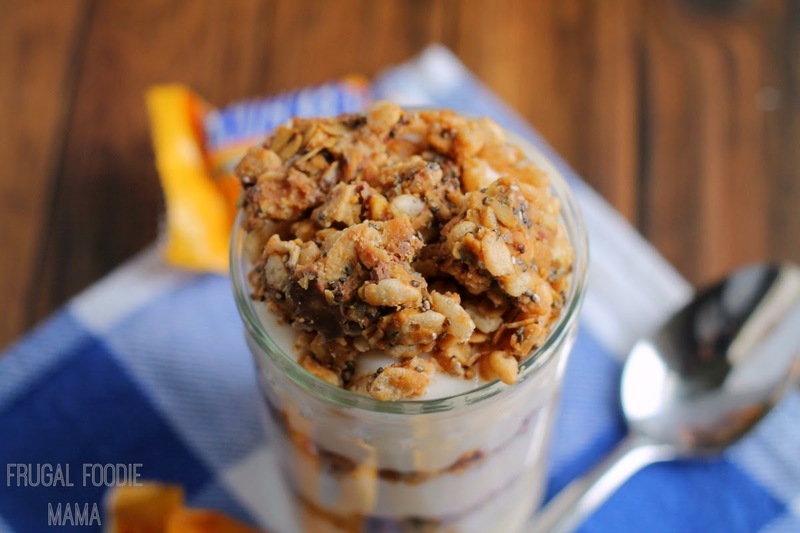 Simply top your cup of your yogurt with the crumble. You can still get a little fruit with it if you choose a fruit yogurt like strawberry, raspberry, or blueberry. Simply grab a handful or two and throw in a plastic baggie to have on hand for a quick snack.